Any electronic device emits some level of electromagnetic radiation. Electromagnetic interference (EMI) shielding and radio frequency interference (RFI) shielding products are used when the EMI/RFI of an electronic product or system, in particular high frequency operations, necessitates attenuation of EMI/RFI to a specific level; the attenuation of a radiated emission to a certain level is designated in industry as shielding. MAJR Products EMI/RFI shielding solutions are able to meet even the most stringent EMC requirements. Understanding antennas and electromagnetic fields is the first step to understanding EMI/RFI shielding. EMI/RFI shielding is important for achieving electromagnetic-compatibility (EMC) for electronic products including digital systems. EMC design is concerned with preventing electronic devices from not interfering with its own operation (crosstalk) in addition to the reduction of electromagnetic radiation that may interfere with other electronic equipment and systems when operating in an intended environment. EMC design also involves preventing circuits from misbehaving as a result of ambient EMI/RFI from communication towers, aircraft, radio stations, etc… With digital systems’ ever-increasing frequencies and edge rates, EMC is becoming harder to achieve. The shielding products produced by MAJR Products can be designed and manufactured to suit the unique needs of specific customer applications. In addition, with experience designing custom EMI/RFI shielding products, the engineers at MAJR Products offer customers flexibility from design, through prototyping / test, and into production. While EMI/RFI Shielding has long been a requirement for military applications’ such as in high frequency electronics, there is also a growing need for microwave absorbing materials in consumer electronics such as wireless LAN devices, network servers, video equipment etc. Depending on the requirements of the application, microwave absorbing material can be tuned to function best at specific frequencies or designed to be used across a broadband frequency range. 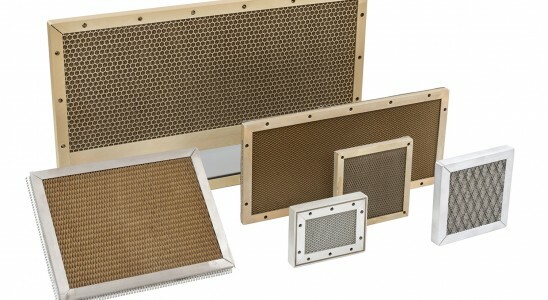 Along with tuned microwave absorber materials, Broadband microwave absorbing material is used in electronic products for a wide variety of markets including cellular and telecom, RFID tags, electronic devices, radar cross section reduction, and a variety of other antenna and electronic enclosure applications. For shielding of RF and microwave applications, MAJR Products 6500 series Broadband Microwave Absorber material product line utilizes material that is elastomer-based, ultra-soft, thin, flexible, and easy to install in even the tightest of applications or irregular surfaces. This absorber can be supplied die cut or water jet cut to meet the exact product specifications. In addition, for installation ease the absorber can be supplied with a pressure sensitive adhesive, typically requested for use in general to high altitude or high vibration applications. Custom Tailored Configurations: using Precision Photo Etching or Stamping techniques, MAJR can supply custom tailored solutions in a matter of weeks. Special Design Features/Finish: providing flexibility for mounting, solder techniques, pick and place automation, lid placement alignment, marking, and overall dimensional flexibility. See how MAJR Products can solve your electronics shielding equipment needs. Contact us for additional product information, free sample products, or to receive a quote on shielding solutions for RF and microwave applications.